Hello everyone! My name is Sophie and I write the blog CosmeticsCase. 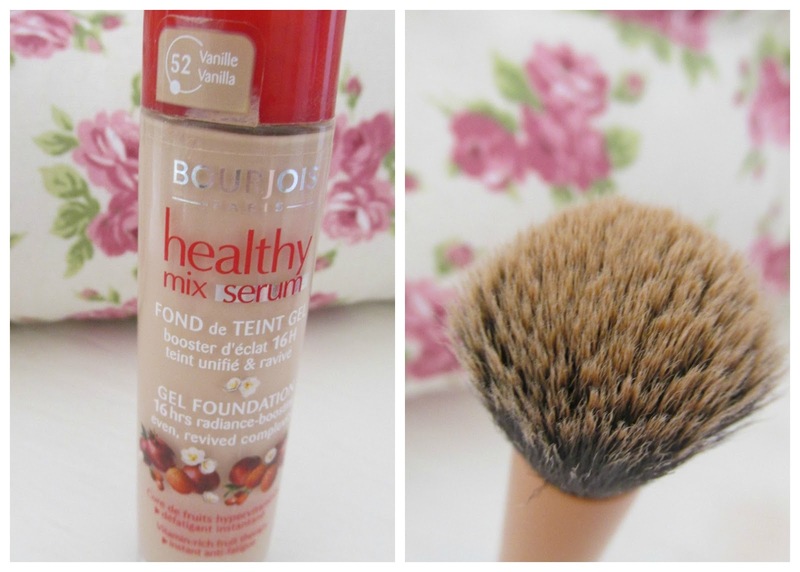 Today I am going to be writing a post all about my favourite ‘Holy Grail’ foundation, the Bourjois Healthy Mix Serum Foundation. It’s not very often that I settle down to one foundation and pin point it as my all-time favourite but I feel like I have tried so many and they have never seemed to be just right. For me it’s like Goldilocks where she try’s all the different porridges and finally finds the right one. Okay…not quite Goldilocks and breakfast but you get my idea. Foundation and the brush I use. With Healthy Mix Serum Foundation- I wear the shade 52. So I tried the original healthy mix foundation and I wasn't really a huge fan because although my skin is oily I have dry patches around my nose and I found it really clung to them which I was shocked about because so many people (with dry skin) had said it worked really well for them. However for Christmas my Mum bought me a few Bourjois pieces and I was quite hesitant to try the serum because I typically like really matte foundations and I didn't think that it would work with my typical needs from a foundation. However the first time I tried it I fell in LOVE. The foundation is hypo-allergenic which is good for people with sensitive skin. It claims to last for up to 16 hours but I would say it lasts 4 hours without needing powder which I expect normally because my skin is so oily. However before the foundation begins to really wear off I would say it last about 11 hours but then I take my foundation off by that point anyways. I love the foundation for many reasons. Firstly it's drugstore and super affordable which is a bonus because I thought that I would have to spend £20+ before I found an amazing foundation. It retails at £10.99 which although it’s at the higher priced end of the drugstore my bottle lasted me just under 4 months using it most days as I haven’t changed foundation since only for probably about a week. Another reason I like it is for the smell because although I typically like a non-scented foundation this smells so fresh. In case you are wondering I use the Real Techniques Buffing Brush and just put the foundation of the back of my hand and then use a circular motion to apply it all over my face. As for coverage with the foundation I feel like it provides a medium coverage and my skin isn’t the best, I do have a lot of spots and imperfections. You can build this foundation up because I have when my skin has been worse and it hasn't looked cakey at all, it looks really fresh and natural. I feel like this is a foundation that looks better over time which I love because I think over the day it looks nicer and nicer. While all the factors above are part of the reason I love the foundation I mainly love the fact that this foundation provides a general healthy glow but provides such a flawless finish on the skin. It covers over everything so smoothly, I love this foundation for when my skin is looking dull because it instantly picks up my skin. There is a good colour range too however it doesn’t cater for a really dark skin tone. I do tend to powder it but that natural glow still shows through which I like. Overall I love this foundation and there isn’t one thing that I don’t like about it. If you have tried this foundation let me know what you think! Thank you for reading my post let me know your thoughts and if you purchase it. If you have any questions about the foundation you can email or tweet me. I tried the original formula and wasn't thrilled. What did they change?